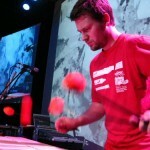 British born Innovative Percussionist regularly appearing throughout Europe, the USA and beyond. I play a 3 Octave Wernick Mk7 Special Xylosynth – I had one of the first Mk6’s off the shelf in 2005 with limited edition blond ash keys but have since upgraded. My XS is hooked up to an Apple MacBook Pro via a Motu 828mk3 audio interface to trigger soft synths and samplers from various programmes including Logic, Max/Msp and Supercollider. I use the XS in conjunction with a selection of Boss / Roland pedals and pads, always in play are a RC50 Looper and an RE20 Space Echo. I received the Xylosynth yesterday and was perplexed as to whether I should play it or place it in an art gallery and charge admission. What a beautiful work of art and well crafted instrument combined. The best non-esthetic feature for me is the real-time length of note control using the analogue control knob. The second best feature for me is that because it looks more like high quality furniture than an instrument, my wife is more receptive to it being set up in our bedroom, where I practice. Thank you very much for producing such a fine instrument. My new Xylosynth has arrived this morning and was a beauty to look at and a bliss to try out. It worked wonderfully "out of the box" with some sounds I had on Reason, and I'm already in love with the "note length" knob!!! I'm sure it will be a truly inspiring instrument. I'd like to thank you all very much for the excellent work, the punctuality and professionality. My best wishes and congratulations! The playing feel of this instrument is where it shines. I’ve had the chance to let two other percussionists try the Xylosynth, and their response in each case matched my first impression verbatim: “It feels like playing a marimba.” The Xylosynth feels very much like an acoustic percussion instrument. The best thing that can be said about the Xylosynth's feel, sensitivity, and expressive capabilities, is that when I play it, I'm not aware of the playing surface. The interface between the player and the instrument isn't a conscious consideration, which speaks volumes to the "natural" feel of the Xylosynth. Can I just reiterate what I said yesterday in my phone call to you about how pleased I am with my Xylosynth. It is beautifully made and a pleasure to play. Last week I used it to play the bell part in Puccini's Tosca and received continued praise for the instrument from both the Conductor and the Artistic Director. This week, it is being used in a production of West Side Story and again I've had praise from the conductor for the instrument. Hooked up to a Kurzweil PC2R, the Xylosynth is producing some amazing results. Using it with the «Cromaphone» -software, works great. The Xylosynth has arrived and it's perfect! I will play it in public for the first time in two weeks! The Xylosynth just might be one of the greatest inventions of all time! It is terrific! Thank you! Audiences are absolutely enthralled by it. Also my performing life has become substantially easier. Lugging a full set of vibes around was rather cumbersome to say the least. When one adds in the module options for different sounds, I can't lose. I'm now a freelance sound engineer and a professional musician. I play with two bands (2 french singers) and I always play the Xylosynth with one of them; David Keler. I love playing the Xylosynth, and everyone in the band and the audience like it. David Keler asked me to have it on every gig! Sometimes I have some questions about it, and I ask people to contact you. Thanks. And yes the Xylosynth is working out great. The kids love it and it really helps us all out having the kids on headphones considering I teach in an office area with no door separating the main band room where other lessons are taking place. I am very very happy with the Xylosynth. It has also proven live in different ensembles (duo, combo and big band). For me it runs on a Macbook Air with Main Stage and GarageBand. Just a courtesy note to advise that my Xylosynth arrived safely yesterday - a day earlier than estimated - thank-you - that is great service from yourselves and your freight company. The instrument is beautiful - I played it for about 30 minutes and it seems to function perfectly too. I'll send another update in a week or so after it has bedded in a little further. My Xylosynth is such a beautiful instrument. I'm really thrilled to have it here and look forward to many years with it. Thanks for working with me through my questions and the ordering process. I really appreciate the high level of customer service. 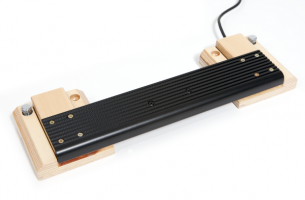 Hi Julie-Ellen, The instrument arrived yesterday in perfect conditions and works perfectly! It is definitely the best electronic mallet instrument I've ever tried. Thanks for your kindness and professionalism.